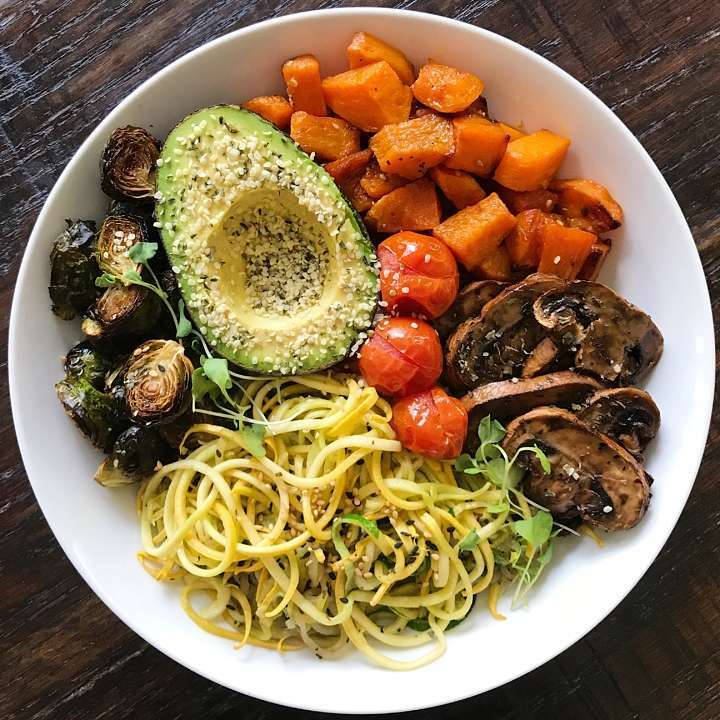 Dinner tonight was a combination meal prep and actually feeding everyone dinner… so kicking off the week with a stocked fridge and this Warm Rainbow Zoodle Bowl. I roasted mushrooms, cherry tomatoes, Brussel sprouts, butternut squash and potatoes. Plus we grilled some chicken using a gluten-free teriyaki marinade. Sounds like a lot but I purchased a lot of the vegetables pre-cut to save time and once quickly seasoned, they just cook themselves more or less. Plus I love cooking large quantities so that there is some left in the fridge to use for lunch, dinner or snacks later in the week. For my dinner, I quickly sautéed some yellow squash and zucchini noodles (purchased already spiralized from Balduccis), and made this bowl. Post photo, I also drizzled it with tahini. It was easy, simple and nourishing.. not just from a nutrient standpoint (but there are plenty of those!) but also because it is warm and cozy, and totally satisfying! Spiced Butternut Squash: Place Butternut Squash in large bowl. Toss with oil, cumin, paprika, and sea salt. Arrange in a single layer on baking sheet. Bake 20 minutes. Turn squash over. Bake an additional 15 minutes or until tender. For more crispy squash, bake a bit longer. Set aside. Using the same pan, heat 1 tablespoon olive oil over medium heat. When olive oil hot and shimmering (not smoking), add garlic, stir for about 30 seconds until fragrant. Add zucchini noodles. Saute stirring frequently until Zucchini noodles are tender crisp, approximately 5- 7 minutes. ( Adjust cooking time if your noodles are thicker or thinner). Season with salt and pepper to taste. Add sesame seeds and stir to combine.